So Yuki dies and Minami yells at everyone that nothing matters anymore and that she really hates baseball. However, the team says they already knew because Yuki told them. Confused, Minami runs away, but Ayano chases after her. Meanwhile, the team falls to a 4-0 deficit after 7 innings by the time Ayano brings Manami to the stadium. Her cheering inspires the team and they close it to 4-3 after the 8th inning, and finish off with a 2 run double by Yunosuke in the bottom of the 9th to win 5-4 and advance the nationals. We're going to nationals! We could have never have done it without the magic book! So it finally took Yuki dying, Jil slapping her, and Ayano chasing her down and tackling her for Minami to realize that, you know, maybe there is more to baseball than just winning. I have to say that Minami’s character really went downhill for me over the last 4 episodes or so. She was being stupid going on about saying how it only matters if they win, and then she practically breaks apart the team. Yay her? I guess she did come back together at the end, but by then I had lost much of the respect I had for her character. On the championship game, apparently whoever wrote it didn’t let the actual rules of baseball get in the way of the drama. Yunosuke was the last out in the 8th inning. However, after 2 outs and 2 baserunners – that is to say, after 4 batters – Yunosuke is back up to bat? 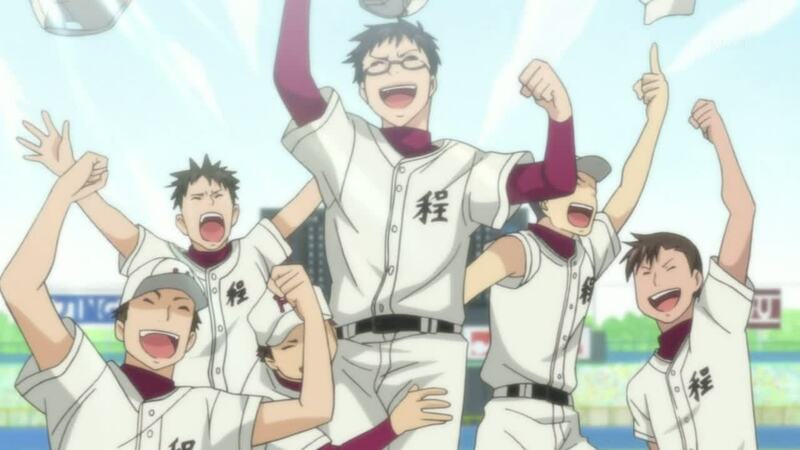 Last time I checked, there are 9 batters in a baseball game, so if they wanted Yunosuke to win the game, they either needed for them to come back from farther down to go through all 9 batters or push it to extra innings. Oops. In the end, I don’t think this was a terrible show. If you strip out a lot of the management book stuff, it’s actually a pretty good show I think. But how they worked in the Management stuff just kept making it feel like some sort of infomercial, or like some guy trying to sell his business’ services during a wedding or funeral or some other time when it just didn’t feel appropriate. Such as like when Nikai goes and blathers about principles of management during an interview about their baseball team. I mean, really? And Minami is happy to have known Yuki…and for having read the book! Because they are so on the same level! This just seemed like a good show that was brought down a considerable amount due to trying to fit in a certain book into the plot whenever they felt they could instead of just trying to make it flow. I thought they had learned that lesson after it seemed like the book references went down between about episodes 4 and 8, but then it stated getting bad again, especially in the last episode. I kind of put up with it to start with since she was just learning about the book and trying to figure out how to implement it in practice. But I felt like eventually they just needed to put the book down and play baseball and tell a story and they just couldn’t do it, and it just resulted in this weird thing where they’re talking about this management book alongside Yuki dying and going to nationals and it just doesn’t play. This is just on top of the fact that I find the idea of someone reading a book and then being able to reform a baseball team in one year as a result a rather silly scenario anyway. I realize anime isn’t exactly a medium where reality plays any role at all, but you still need a suspension of disbelief, and despite all the shows I’ve seen that have magical girls and giant robots, and what not, this is actually one where it was difficult for me to hold a suspension of disbelief. I guess part of it is that it was actually trying to be serious when I found the scenario to not really be that realistic. If one is able to see past all of this, then perhaps you’d enjoy the series, and I still did enjoy it myself to an extent. But it could have been better executed.